On September 29, the Mumbai suburban train services saw one of the worst catastrophes in its history when 23 commuters lost their lives in a stampede at Elphinstone Road railway station. An enquiry committee of the highest level was formed, and the entire railway system is mobilizing to review and rework the way it provides passenger amenities and safety facilities. But this incident was about more than overcrowding a narrow foot bridge. It should compel policymakers to rethink transportation integration at a larger level. Much of the focus after the deadly accident has been on adding more capacity. But if adding more train service was such an easy solution, then the World Bank-funded Mumbai Urban Transportation Project (MUTP), which has cumulatively invested more than $1.4 billion to upgrade and enhance suburban railway infrastructure, would have had a bigger impact by now. Instead, despite more than 2,800 suburban train services a day reaching some 8 million Mumbaikers, the average commuter still faces “super-dense crushed load” conditions, with up to 16 hapless commuters per square meter of train space. In initiatives like MUTP, it is frequently assumed that new capacity will bring more comfort to riders. The first phase of MUTP aimed to bring down the number of passengers per train on the Western Railway during peak periods from 4,500 to 3,600, but could only achieve 4,016. The next phase started from a baseline of 5,400 peak hour passengers per train on the Western Railway route and set a more realistic target of 4,000, but could only achieve 5,257. Yet, some policymakers have yet to learn these lessons. The third phase of MUTP is currently focused on quadrupling the length of track and adding additional train services. To truly reduce congestion on suburban trains in the medium to long term, planning must take into account the bigger picture and become much more integrated. 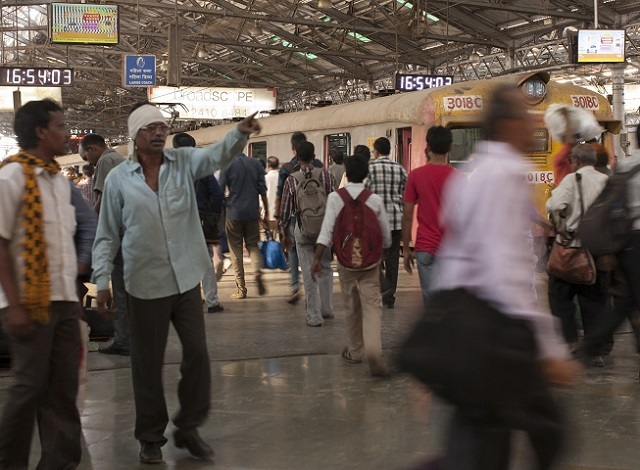 Some 22 percent of commuters on Mumbai suburban trains travel less than 10 kilometers. Many could easily be shifted to non-motorized transport modes, like walking and cycling, if they had access to adequate and safe infrastructure. The example of congestion at Elphinstone Road is pertinent here. A large chunk of Central Railway route passengers get down at Dadar to catch the slow local to the next two stations, Elphinstone Road and Lower Parel. If there was well-developed cycling infrastructure integrated with the railway system, many commuters could easily cycle the 2.5-kilometer distance from Dadar to these stations instead. It would take just a fraction of the $1.4 billion invested in MUTP projects to date to develop robust, sustainable cycling and walking infrastructure. Such changes would decongest trains far more effectively than adding more service. If needed, further mode shifts could be encouraged through fare changes to balance congestion and encourage healthy, sustainable modes of transport. Why hasn’t this been done already? Fault lies with the institutional structure of the transport sector. India is the only country among the top 100 economies of the world where responsibility for transportation is segregated by mode across multiple government agencies. There is the Ministry of Railways, Ministry of Road Transport and Highways, Ministry of Shipping, and Ministry of Housing and Urban Development. Each handles some aspect of transport policy, but barely talks to the others. Add in the various state governments and you have a complex labyrinth of departments with virtually no convergence. There could be millions invested in a project within one ministry, but when an issue requires inter-departmental or inter-ministerial coordination, then no matter how beneficial the resolution might be for citizens, departmentalism makes it difficult to achieve. The case of universal ticketing for trains in Mumbai is a glaring example. After more than two years of futile attempts by the railways, Maharashtra Government and Mumbai Metro, there is nothing to show. What Mumbai needs is not just more foot bridges, escalators and trains but a more mature and nuanced treatment of the transport policy landscape. Developing multiple modes of citizen-centric, integrated transport, with a focus on cheap and sustainable options, would go much farther toward preventing the next Elphinstone Road disaster than more tracks and more trains. Vineet Abhishek is a civil servant working with Indian Railways.